Many might not be familiar with backpack vacuum cleaners but for a small business, they are the top pick when it comes to maintenance. In fact, they are so practical that even some homeowners use them domestically for several reasons. One important factor is their efficiency. A backpack cleaner is usually powered by a rechargeable battery pack. This gives the user a lot of mobility. Also, they are much more powerful than regular cordless vacuum cleaners. Mobility combined with power means cleaning up larger surfaces over a shorter period of time. Classic vacuum cleaners have the problem of reducing mobility by having to be plugged into a power outlet and the vacuum will only go where the power cord allows it to. For this reason, backpack vacuums are considered significantly more efficient as mobility plays an important factor. For business owners, backpack vacuums are more of a second option when they should not be. Regular, industrial vacuum cleaners are more popular but they are not as practical. Compared to regular vacuum cleaners, backpack vacuums can reduce costs. They still need the power to run but because they make it easier to clean the same surface in less time, they save money on labor. Also, they are much easier to store since they are made to be compact and easy to carry but most importantly, they are much safer to use since they usually come equipped with better filters. In fact, they can improve air quality in a room by simply removing small dust particles and impurities from the floors and trap them into the vacuum. There are many more things that can be said about backpack vacuums but for now, let’s get right into our recommendations for the top 10 best backpack vacuums in 2019. 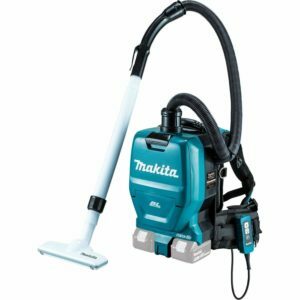 Which Backpack Vacuum To Pick? 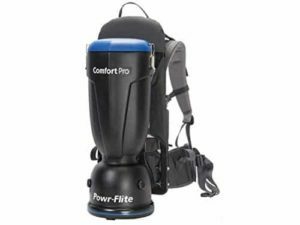 Powr-Flite BP10S ComfortPro backpack vacuum is a high-performance model in a rather compact form factor. It is an 1100 watts vacuum with a 10-quart capacity and a weight of about 13 pounds. The vacuum is quite powerful and lightweight. This is because it is a corded model and it does not have the added weight of a battery pack. Inside the kit, users will find a 17-inch crevice tool, carpet tool, hard floor tool and several other accessories. The shoulder straps are quite comfortable and can be adjusted quite easily. Makita XCV05Z is a professional grade model made mostly for commercial application. It uses a powerful motor that is capable of 53 CFM in terms of air intake and works one a built-in battery. The battery offers up to 90 minutes of use on a full charge. Filtration is done using a HEPA filter that captures small particles while the motor is optimized for energy efficiency. With the battery installed, the backpack vacuum weighs about 9.4 pounds but the shoulder straps make it quite comfortable to carry. Sanitaire EUKSC535 us a great option when it comes to efficient and powerful backpack vacuums. 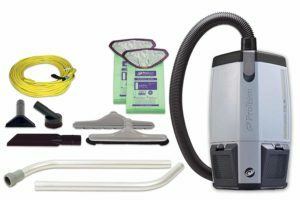 It is an 11.5 amp vacuum with a large back and advanced filtration that helps it retain even the smallest dust particles. The vacuum is also surprisingly quiet compared to other models. Also, it is worth noting that this is a corded vacuum but the power cord is quite long. In terms of weight, the model is approximately 24.2 pounds but the shoulder straps help distribute the weight properly. Powr-Flite BP6S is one of the more popular vacuums from the brand. The model is also significantly more affordable than their other offerings. It is a compact vacuum with a rated power of 1100 watts, weighing just over 12 pounds. The model has padded shoulder straps that can be adjusted and a small handle at the top. In terms of raw power, the model has a CFM of 130 and manages to be quite silent compared to another vacuum. As for filtration, the vacuum has a HEPA bag and a pre-motor filter. The Sanitaire EURSC412B is a great pick for the ones that are looking for something quiet. It is a powerful 11.5 amp vacuum cleaner that has a noise output of just 69 decibels. 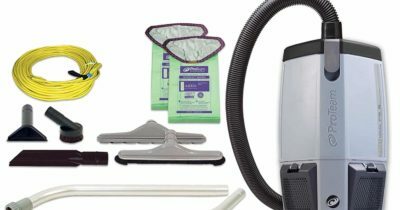 The vacuum uses disposable 6-quart bags and a HEPA filtering system. It is a corded model but the 50-foot long cord does give a certain degree of mobility. In terms of weight, the vacuum is just under 12 pounds and has adjustable padded shoulder straps. Some might not think much when it comes to the power cord except for its length but thickness and weight tend to be overlooked. 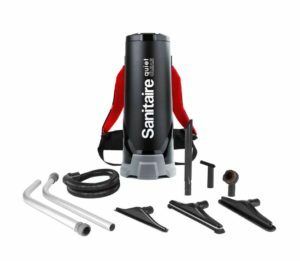 The power cord used for the Sanitaire is long and does allow for a certain degree of mobility but it is very thick, heavy and a bit difficult to move around because of it. ProTeam ProVac FS 6 is one of the more powerful models on our list. 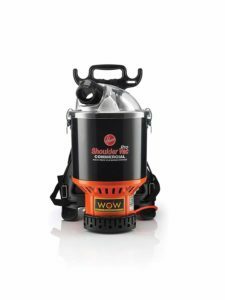 With 159 CFM and a large 6-quart capacity, the vacuum can cover large surfaces in less time and without having to replace the dust bag. The vacuum comes with multiple accessories, a long power cord, and 2 bags. Filtration is done using a HEPA media filter. The 50-foot long power cord will allow for some mobility while the shoulder straps should ensure that it is comfortable to wear for at least one hour. The vacuum is great for commercial use. It is very powerful and quite lightweight but with high performance comes also a higher price tag. For use at home, there are cheaper alternatives but for a small business, the vacuum will prove its worth. The Atrix VACBP1 is a good backpack vacuum for the ones that need to deal with surfaces that collect a lot of dust. It has a 4 level filtration and uses a large 8-quart dust bag. The model is just 10.3 pounds and has padded adjustable straps including a belt loop. According to the manufacturers, the vacuum is suitable for both commercial use and at home. The low price tag makes it quite appealing while the 12 amp 1400 watt motor ensures it is powerful enough. The backpack vacuum was designed with a special belt that is meant to hold the accessories. This should make it easier to move around without having to go back to get a different accessory. The only problem is that the accessories cannot be attached to the belt which voids the whole purpose. 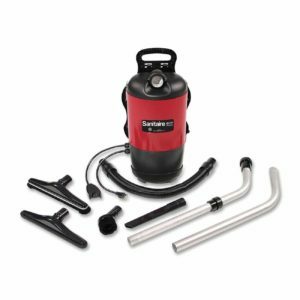 ProTeam Super CoachVac is a commercial grade backpack vacuum that comes with a complete kit including plenty of accessories and a long telescopic want. The vacuum makes it easy to reach even difficult areas while the HEPA filters ensure that the dust and small particles do not escape. What is most impressive about the vacuum is the fact that it has a 10-quart capacity and weighs just 11 pounds. The model has a 50-foot power cord and manages to be extremely quiet. For a regular homeowner, it might not be worth spending this much on a backpack vacuum. For a small business, the vacuum is ideal mainly because it has a large 10-quart capacity and a very long power cord. The filtration system also helps clean surfaces in one go. The Hoover C2401 is one of the more affordable commercial-grade vacuum cleaners on our list. It is a simple backpack vacuum with adjustable straps and a powerful motor. Being a corded model means that it is also lightweight as it is just 10 pounds. Capacity is quite decent but it is worth noting that this is a bagless model. 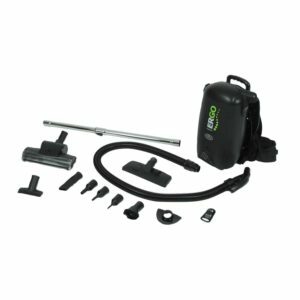 As for power, the vacuum uses an electric motor that is capable of a decent air debit intake and a good filtration system that prevents the dust from escaping. When it comes to backpack vacuums, comfort is important. This is why they come with adjustable padded shoulder straps but they also need to be stable. Most models have a waistband just like the Hoover but the Hoover waistband feels quite tight because it is a bit short. 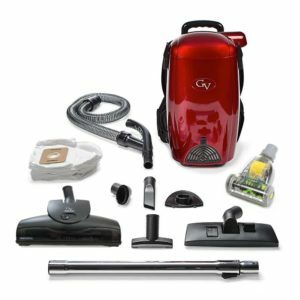 The GV backpack vacuum is by far the most affordable option in our list. 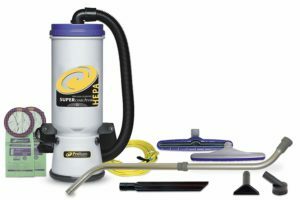 It is a simple vacuum with a large 8-quart bag size and a 4 stage HEPA filtration system. The kit includes all the required accessories including a telescopic rod and attachments for all types of surfaces. The cord of the vacuum is just 25 feet but for use at home, it should be long enough. As for weight, the vacuum is just 10 pounds and quite comfortable to carry around even for more than an hour. The attachments that come with the vacuum are a bit difficult to put on and take off the rod. The user needs to have a strong grip but also it is important not to push too hard when putting them on otherwise it can become extremely difficult to take them off. Weight: Weight is probably the most important aspect. A powerful vacuum does not have to be heavy but a comfortable backpack vacuum needs to be lightweight. If it is too heavy, it will become too difficult to carry it around for more than 30 minutes. Cordless or corded? Cordless backpack vacuums offer a lot of freedom since they do not need to be plugged in but they do not run for long on a full charge. Also, they are quite heavy. The corded ones usually have a very long cord and they are much lighter in terms of weight. Capacity: Capacity is important. The bag needs to be large enough to be capable of collecting enough dust so that it will not need to be replaced in the middle of a cleaning operation. It should be at least 6 quarts.